“Pray to the Lord to take away the serpents from us,” the people say to Moses. They’ve come to one of those snaky places in life. They’re impatient and wandering in the wilderness. They are thirsty and hungry. Even if they didn’t like the life they once had in Egypt it was their life. It was familiar and they want to go back to what used to be. They’re grumbling and nothing is right. Life is difficult. This is more than just being unhappy or dissatisfied. This is how bad it is. They complain that they have no food and then say that they detest the miserable food they don’t have! I don’t think that’s really about what going on around them, but about what’s going on within them. Their stomach may be empty but there’s venom in their hearts and in their lives. They are in a snaky place. And we’ve all been there. Sometimes the snakes of our life strike and bite when we least expect it. They take us completely by surprise. Sometimes we wander in the snaky places of life despite our best intentions. We didn’t choose that place. We didn’t deserve or do anything to be bitten but we were. Other times it was about something we did or said. More than once my wife has warned me, “You better be careful. That one’s going to come back to bite you.” And haven’t there been times when you just wanted to run away and escape life? It was too snaky. You didn’t want to deal with life or face what was coming your way. “Pray to the Lord to take away the serpents from us.” How many times have we prayed that? “Just fix it God. Make it stop. Take it away. I don’t want this.” And it’s not always in the wilderness. Remember Jesus in the Garden of Gethsemane? “Remove this cup from me,” (Luke 22:42). Jesus knew about the snaky places of life. We all do. We’ve walked in the snaky places of life not only as individuals but as a people and as a country. The Me Too Movement is the recognition of a snaky place. The high school students protesting gun violence are pointing to a snaky place. What are the snaky parts of your life today? What are the serpents that bite? What in your life do you want to escape, run away from, avoid, and not deal with? “Pray to the Lord to take away the serpents from us,” the people say to Moses. Moses prayed to the Lord. What does God do? God did not take away the serpents from the people. That’s been my experience as well. God has not offered a magical fix. I’ve had to face my serpents and deal with the snaky places of my life. It seems snaky places are a part of life. God did not take away the serpents or stop them from biting. Instead God, sent another snake. 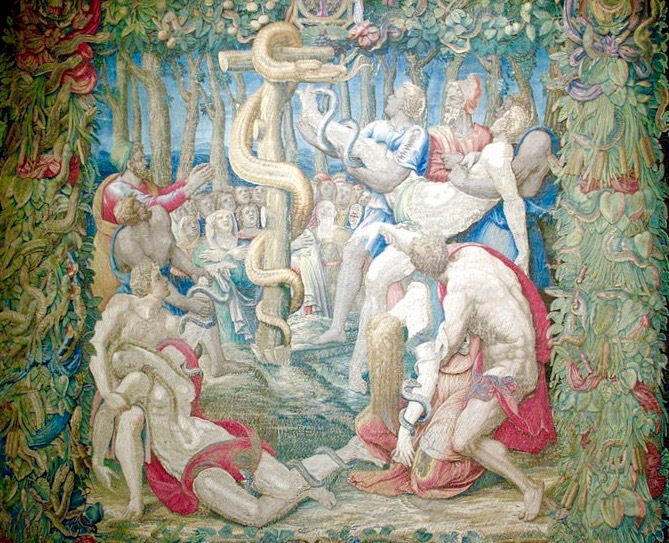 God tells Moses, “Make a poisonous serpent, and set it on a pole; and everyone who is bitten shall look at it and live.” God offered an antidote to the snakebites of life. And it’s a strange one, isn’t it? The serpent that bites and kills and is also the serpent that heals and give life. That doesn’t make sense but what if that’s really how it is? What if the snaky places are not so much places to escape but places from which soul-medicine arises? Can opposites really coincide in that way? Think back to high school physics. Do you remember Newton’s third law? For every action there is an equal and opposite reaction. Two opposing forces arising at the same time and in the same place. Where does the anti-venom to treat snakebite come from? It comes from the snake’s venom. What about the immunization that protects from disease? It often comes from the same virus that causes the illness. Think about the coinciding of opposites in our own tradition. “Those who want to save their life will lose it, and those who lose their life for my sake will find it,” Jesus says (Matthew 16:25). The cross that kills is also the tree of life. The empty tomb of resurrection is already hidden in the crucifixion. Every sin, misstep, or wrong choice holds out repentance as an antidote. Reconciliation is the medicine planted in our broken relationships. Eternal life is found in the Son of Man lifted up on a cross (John 3:14). Let’s not be so quick to say, “It’s either this or it’s that.” That does’t seem to be the way of God. Maybe it more accurate to say, “It’s this and it’s that.” It’s not an either/or but a both/and. That’s the tension we live in and it’s a tension that lives within us. That’s the tension the Israelites are in today. There’s a snake that bites and kills and a snake that heals and gives life. They must decide to which one will they give their attention and focus. So must we. We too live in that tension. We too have the same choice before us. Look at that tension in your own life. We claim certain values for our lives but we often do the very opposite. Sometimes we say one thing and mean another. Or in the words of St. Paul, “I do not do what I want, but I do the very thing I hate” (Romans 7:15). It is so easy and tempting to take Jesus words and begin categorizing ourselves or others into people of light or darkness, people who do what is true or do what is evil. Which one am I? Which one are you? Maybe it’s not about one or the other. Maybe it’s about both at the same time, the coincidence of opposites. Maybe Jesus is describing our life. Haven’t there been times when you have believed and other times when you didn’t or weren’t really sure what you believed? Haven’t there been times when you did the right thing, the true thing, and you knew it? And other times when you did or said the wrong thing and you knew that too? I’ve been and done all those, and I’ll bet you have too. To stand in the tension of those opposites is to begin to better understand and clarify who we are, what our priorities are, where our loyalties lie. That tension is what can shape and transform our lives. Acknowledging that tension makes us face ourselves. It asks a question of us. To which one will we give our attention and focus? Look at the snaky places in your life today. Acknowledge the contradictions within you. Recall the serpents that have bitten you. To what are you giving your attention? Do you need to change your focus? What would it mean to shift your attention from the biting serpent to the bronze serpent? I don’t mean that we ignore or deny the biting serpents, pretend they are not real, or that we become pollyanna. I don’t want us to be naive about life, our self-contradictions, or the venoms of this world. I do want us to be alive, hopeful, and whole. I want us to find the medicine our soul needs. And that means acknowledging the biting serpents even as we look up to and give our focus to the bonze serpent. The one to which we give our attention will fill our hearts and shape our lives. To the degree we give our attention to the biting serpents and the venoms of this world, we will become toxic to ourselves and one another. If we give our attention to the light, the bronze serpent, the lifted up Son of Man, we become life and light to ourselves and for one another. What is the medicine being offered you today? What’s the antidote, the anti-venom, you need? The life-giving serpent is as real as the biting serpent. The medicine is as present in our lives as is the venom. Both are to be found in the snaky places of life. To which one will we give our attention? Whatever the snaky places of your life are today, the gospel promise is that there is an antidote to the venom, a healing for every bite, a life for every death. There is hope in the midst of despair, forgiveness in the midst of sin, reconciliation in the midst of brokenness, strength in the midst of weakness, light in the midst of darkness. That medicine is already within us. There is not one of us here today that does not carry the medicine within her or him. The prescription was written in the beginning when God created us in God’s image and likeness. It was refilled when we were “sealed by the Holy Spirit in Baptism and marked as Christ’s own forever.” The medicine of Christ has never gone away or run out. The vial has never been and never will be emptied. It is, however, continually poured out on the world as the love of God. For every biting serpent there is a bronze serpent. For every snakebite there is an anti-venom. The question is not whether the medicine is present and available but will we take it. To what are you giving your attention this day? I am very grateful to you for the Word of God! I am very sorry that I live far from you – in Latvia, otherwise it would have long come to you on a private bikt. God is not at all. But God can be in everything! Thank you! Pāvils, thank you for your kind words and for reading my blog. Thank you Diane. I am glad it was helpful.